Make the most of your less-than-ideal booth location with these tips. When you’ve put a lot of time and effort into planning your trade show experience, it can be a little discouraging to get to the venue to find that your booth location is less than ideal. Of course, it has been shown that certain locations on the floor are better for visibility and foot traffic, but it’s not the only factor in play when determining the effectiveness of your company’s display! Once you’ve partnered with an experienced trade show logistics team like AFP Expo Logistics to get all of your materials to the venue, use these strategies to make the most of your less than ideal booth location. Lighting is a great way to draw attention to your trade show booth. You can bring in attendees by utilizing up-lights and moving lights. Then, use accent lighting to prioritize what you want your visitors to see at your space. A back-lit graphic is another great way to make your company or message stand out. 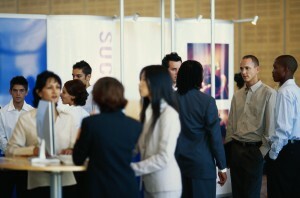 The position of your table can also make or break your trade show experience. Invite your visitors in by placing the table in a position where it isn’t impeding their ability to do so. In addition, keep text on the table to a minimum. The text should draw the attendees in, but your employees should be the ones verbally providing them the information to hook them. Finally, complement your table layout with the effective use of engaging technology, such as videos, graphics, and other media. One of the best ways to stand out at a trade show is to deliver an unforgettable experience to your attendees – don’t be boring and give them a staid sales pitch! The most important thing to do is to give your guests the ability to interact with your organization in a deep way. Product demos are a great way to do this, as are touch screen programs and tablet games. With strategies like these, you can overcome your booth location and deliver trade show success to your organization. And if you need help with any and all trade show logistics problems, contact AFP Expo Logistics today! This entry was posted on Friday, March 31st, 2017	at 9:39 am	and is filed under AFP Expo, Trade Shows	. You can follow any responses to this entry through the RSS 2.0	feed. Both comments and pings are currently closed.